Discussion in 'General Freemasonry Discussion' started by Timothy Fleischer, Apr 17, 2012. I want to share this with you. I received my great grandfather's Masonic ring just last week from a girl cousin. My great grandfather had two girls and no boys. He was a Mason in Atlanta, Georgia. I enquired to the Grand Lodge of Georgia about his Masonic record and got this information back from the Grand Secretary. I am a genealogy nut and history buff and Masonic student, so this was all right up my alley! Thought I would share it with some brothers who might appreciate it. In reference to your e-mail received on November 18, 2011, our records show Thomas Glenn Cameron was a member of our Long Cane Lodge No. 132 and was first shown on roll in 1865. We do not have his degree dates. He later joined Union Lodge No. 28; both Lodges located in Troup County. Mr. Cameron was shown as suspended in 1876. This is all that we have on Mr. Cameron. Here is Thomas Glenn Cameron Sr.
Also, Thomas Glenn Cameron, Jr. was shown on roll with E.A. Minor Lodge No. 603, located in LaGrange, GA. He received his 25-Year Award in 1949 and became an Emeritus member in 1960. Mr. Cameron was in good standing at the time of his death in 1970. This is all that we have on Mr. Cameron. Here is Thomas Glenn Cameron, Jr. Here he is wearing his Masonic ring, as an elderly man. He died when I was 4, but I did meet him. Very cool. I like the history that you got on both. Wow! How very awesome to find all that out. Very, very interesting as well. I had much less luck looking up my grandfather's Masonic history. Count yourself very lucky! 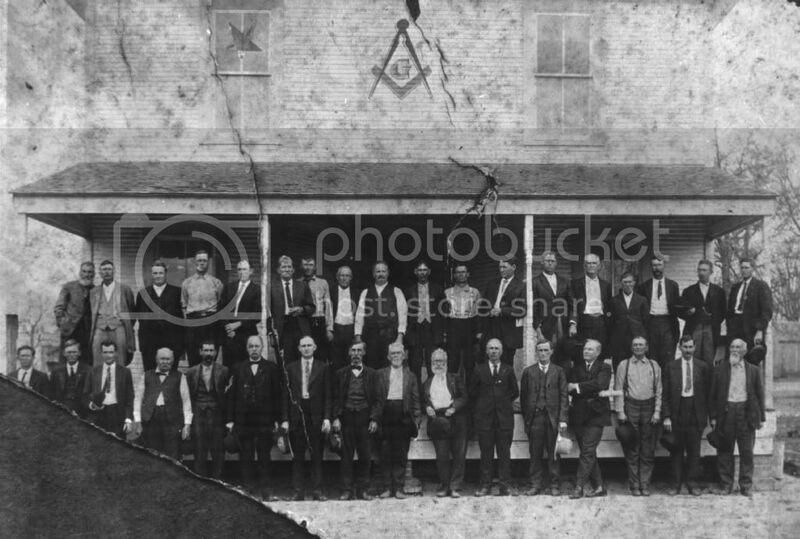 My Great Grandfather and Grandfather were both Masons in the two Lodges that once resided in Iola, Tx. Grimes County. My Grandmother has 3 of my Grandfather's Masonic rings 1 of which being my Great Grandfather's. When she found out that I had become a Mason she told me that she would find the rings and hand them down to me. One of my Aunts then found out that she had them and said that she wanted them. So, I will not be getting them. It would have been a great pleasure and honor to wear the ring of my Great Grandfather or Grandfather. I have my uncles Masonic ring and my grandfathers Masonic apron, 50 year veterans medal and his three hardy books as well as my grandfathers 3rd degree certificate. Plus I got to sit in the lodge my grandfather and uncle belonged to. It is Quinabog Lodge AF&AM in Southbridge,MA. They became master masons on Nov. 3,1941. Does anyone have any Masonic rings for sale or knows anyone that would like to pass on a antique ring? Brother, you may still get to wear those rings. It may take a letter or a sit down talk with your aunt about what it would mean to you as a Mason to have those rings. Are her sons Masons? She may be saving them for her sons. You might find a great amount of enjoyment from visiting and sitting in the Lodges where your ggf and gf sat. I am going to have a talk with her since neither of her two sons are Masons. The lodge my Great Grandfather belonged to was gone many years ago. The one my Grandfather belonged to had it's charter pull sometime in the 80's or 90's and the Brothern went one of two places. Some joined the Bedias Lodge and some joined the Orphan's Friend Lodge #17 which is my home lodge. A picture below of my Great Grandfather's Lodge. Just so happen he was sick and did not make the photo. Just got the info on my great grandfather, a mason in Akron, Ohio. Raised in 1948. Very cool to learn the history of families. Hello Brother Texas Mason 73, I am very strong on Texas Masonic history for my "Small Town Texas Masons E magazine". which Lodge is the one in the picture of your Great Grandfather's Lodge.. You can email me at pineilse@swbell.net. My grandfather (By marriage, but he never made any distinction, and I never thought there was really) was a mason for over 55 years. Raised in the 50's. Even though I didn't become a mason until after he passed, everything he taught me was related to the morality of a mason. Recently I was back home in PA and my grandmother gave me a bunch of his masonic pins he used, though my uncle (Like a son to him) got his ring. There is some amount of disappointment in this as my grandfather gave my uncle the ring that he wears, and I would have been incredibly honored to wear my grandfather's masonic ring. But at the same time I understand why he'd want to keep it. My wife's grandfather ended giving me his masonic ring on the same trip oddly enough. He was raised in the 60's, and got his ring in 1967 from another mason after getting into the Shrine. It is very beautiful, and I am honored to receive it and wear it on special occasions. The thing that is so great about masonic rings is that there is so much history and giving that goes on back and forth with them. I'm glad to see so many heart warming experiences being shared. Fascinating stuff - I envy you guys your history. As far as I know I am the first mason in my family. It makes digging into my past interesting, I'd be thrilled to find an ancestor who was a member of the fraternity. My great-grandfather (my grandmas dad) was a mason and got my grandpa to join. My great-grandfather bought a masonic ring when my grandma graduated high school, and after he had a stroke, he gave it to my grandpa. My grandpa gave it to me two years ago when I was raised to master. They were both raised in Kansas, so I haven't been to their lodge, although my grandpa is a pass master of a lodge here and he just got installed as WM in the lodge I'm a member of.